Shot this today......MAN THEY ARE QUICK! I live in California too.We have the Anna's hummingbirds all year long. They fly so fast around my flowers and stop like magic to sip the nectar.I think this photo shows that magic. It is just so incredible how they can hover like they do at the feeders. I can tell that this guy is enjoying his dinner.Love hummingbirds! I watch the hummingbirds zipping around my flower garden. I have tried and failed to get any good pictures. How did you do it? The wings are so clear. You couldn't have said it better man. These guys are quick. How did you get that photograph.I take pictures all the time. I really admire how clear the wings can be seen. Most of my photos show the wings as a blur. Do you use a Tripod? 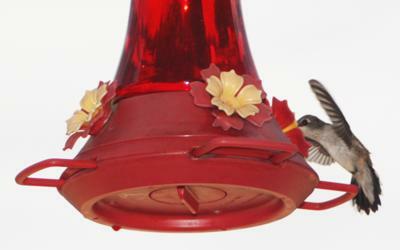 I got one for Christmas, so next summer I plan to use it for my hummingbird photos. Thanks. This picture makes me happy.I don't know what it is really. It just seems that the hummingbird is happy drinking the nectar.I have six hummingbird feeders at my house. The hummingbirds use all of them. I love to watch them in the summer. I wish they would stay all year long but they would be too cold.I always hope they find their way back to me. It isn't easy to get a shot from that angle. The wings and tail are really distinct. Where were you standing when you took that shot.What kind of camera did you use? Do you remember what time of day it was? It is an interesting photograph. They sure are .Good shot man!! I like the clarity of the wings.